I just wanted to let you all know that here you can view some photo's of the seminar on frilled headwear held in the Middelaldercentret in Denmark last September. --> These photo's have now been removed by the owner of the site. Here, here and here you can see some experiments done by Gina Barrett. Here you can see a frilled veil made by Cailin. She is not a member of the Kruseler Research Group, but I like her reconstruction very much. Here is one of my previous posts about my own research and experiments. An official description of the Kruseler Project can be found here. Does anybody know their silk? These are the tassels I made for Joris. I used Aurora fine 2 ply spun silk, and it is so much better for making tassels than Devere 1200 dernier filament silk! I did the yellow embroidery with Devere 1200 dernier silk, though, because it's more shiny. 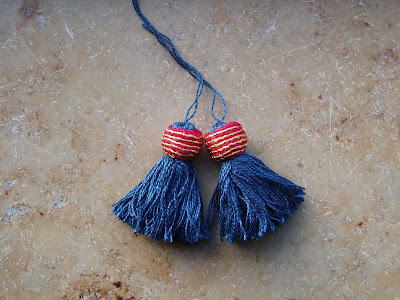 These tassels have a linen core, just as the tassels in the previous post. This is a page from my sketchbook. 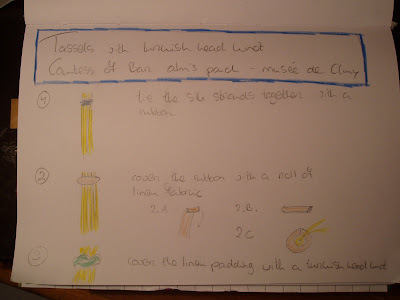 I tried to draw a "how to" for tassels with turkish head knots, based on a mid 14th century alms purse in the Musee de Cluny. The museum has got two purses that probably belonged to the countess of Bar. 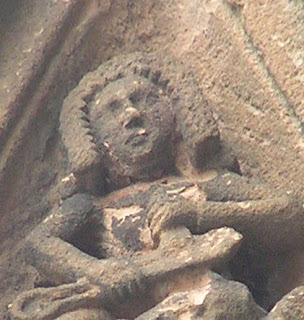 One purse is featured on the website of the museum. The other purse is of the same style, and has got five tassels with turkish head knots. I could study the tassels in detail. The turkish head knots were made with five parallel strands of gold thread (so the knots were not green, as in my picture :-) . Most of the gold foil had worn off. The turkish head knot from one of the tassels was missing. This detail showed how the tassel's silk strands were first tied together (with a blue/grey ribbon) and then covered with some kind of roll of linen fabric. I think the turkish head knot must have been tied over this linen core. For the first time ever I tried to do tabletweaving. I need a pair of beautiful garters to match my medieval outfit.